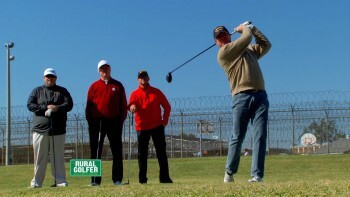 STEVE ELKINGTON: This is the only prison in the United States that has its own golf course. Certainly the most contrasting view. You could hear the balls bouncing where the guys are shooting hoops. Hey, look at them guys over there playing basketball. I bet they wish they were playing golf. CHRIS EWING: You think so, huh? STEVE ELKINGTON: When the reality of all that becomes sort of apparent to you, it's just unusual. -My dad is an assistant warden here. My grandfather was the head warden here. NARRATOR: --and lands himself in a little trouble. -Can't practice this swing in here. -Do you want to lock him in? NARRATOR: "The Rural Golfer" is headed your way. THEME SONG: One, two, three, four. We got the big show revving, their eyes are on the map. Where we're going next we just can't say. Grab the clubs, let's hit some balls. We're making friends and playing golf. "The Rural Golfer" is coming your way. STEVE ELKINGTON: I am standing on quite possibly the most unusual golf course in all of America. 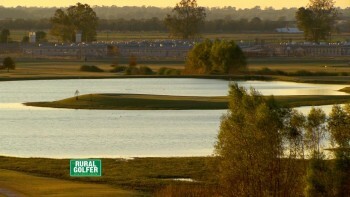 Prison View Golf Course, Louisiana State Pen at Angola. NARRATOR: The story is told in numbers. 6,300 offenders, 1,800 employees, and 18,000 acres of land. By the book, it's the Louisiana State Penitentiary. More commonly, it's Angola. BURL CAIN: We call it the land of new beginnings to the inmates, because they come here with all kind of horrible, you know, charges, and bad sentences, and so forth, because this is a maximum security prison. And so this is where we start life over. NARRATOR: Angola, named after the area in Africa where former slaves came from, opened its doors to begin closing its bars in 1901. Even the most hardened criminals were said to have broken down at the news of an impending stint in what is today the largest maximum security prison in the country. But Angola is not only a home by force. To many of its employees, it's the home of choice. BURL CAIN: This is a large prison. Over 6,000 prisoners are here. So this is a big community, and it employs about 1,500 more. So to keep the employees close in case we have an emergency is really what this is all about too. -Do you want me to lock him in? Can't practice his swing in here. STEVE ELKINGTON: If I had to be in there for a long time, I'd get a Tempur-Pedic. NARRATOR: Clearly not cut out to serve time. -Yeah, it looks like I don't want to be there real. NARRATOR: Elk heads out to where he's best served. -Well, you're pretty athletic. I mean, it's not going to take much longer to get you tuned up to beat these two characters. People are going to notice that we got the Angola tact hat on. We're the tact team. If we turn around, mate, and look at our competition here, what's the first thing that comes to your mind as you look across here at these guys? -This is our friend Trampus Butler. And he's the club champ here. JOE LAMARTINIERE: Got the course record. -Now, look here, Chris Ewing, who actually introduced us to this whole shoot. Chris and I have been friends for a long time. Here we are. -You've lived your whole life in Baton Rouge, and you've never been to Angola State Prison Golf Course. -I've heard about it. But I've never been. STEVE ELKINGTON: This is the only prison in the United States that has its own golf course. CHRIS EWING: And it's nice. STEVE ELKINGTON: And it's nice. CHRIS EWING: Yeah. This is going to be a lot of fun, and I'm predicting right now that we will win this little three-hole match. -Joe has chosen me as his partner today to take on these LSU boys. You're looking at me with like fire, fire. -Looks like he's read, isn't he? It's a fire in your eyes. -I wish we had a fire. It's cold. STEVE ELKINGTON: What are we going to do? The loser has to get handcuffs? -You hear them handcuff for us? What about them getting a handcuff, huh? I don't think we're going to lose this match. See, I've always kept my right hand towards the target like this, trying to keep it like this as much as possible. But when I get here, the club is in a pretty good spot. But I know it's closed coming down. STEVE ELKINGTON: And then you just open it, right? -I try to do this all my-- try to take it like to right here. It's supposed to be right here, isn't it? I cannot hit a golf ball like that. -He doesn't need much, because he's already good from inside of a 100. He's a good putter. He already hits the ball down there pretty good. It's just whether or not he would like to have more things available to him as options. If I've got the club to there, I only have to keep going up a little bit further to keep that square. Right? So as I go from here to here, I keep my elbows close together. That holds that package together. Then I hit it, and then I keep it together again, right? -So that's one part of it. Rather than take apart his good golf game, I just said, look, let's just talk about this over here. So you can see you've got the-- built up some tension there. If I come over here, and I grab-- I gotcha. I grab this. Now, I hold this. I got it. Now, I move that first. What do you feel in your hands? -But do you feel power? -That's what we want, isn't it? -Yeah, I mean you feel it tight there. -You feel it wants to go into the ground? -Yeah, you see that? This is where all-- this is where the magic happens, so to speak. - --before you get here. STEVE ELKINGTON: Look at that. They had the position there. STEVE ELKINGTON: Shoot, I didn't like it. I loved it. -If you like it, I love it. NARRATOR: If unique is the quality of a golf course which yields the ultimate feather in the cap, then Prison View Golf Course at Angola has the whole bird. -I've played a lot of golf courses, and it's the first one that I've ever had to go through a security gate to get to. So it is unique. NARRATOR: What was once a bull pasture is now a nine-hole track open to the public without prior record or ties to Angola's inmates. The driving force behind the course, which didn't cost taxpayers a dime, wasn't just to improve one's game, but one's life. BURL CAIN: We thought it would be a good idea, because we could turn it into a vocational school, and we could train inmates for skills and trade. But in this case, they would be able to manage lawns, and city parks, and golf courses, and would be employable. So there is 20 students that work here and are trained and learn how to do just that. TRAMPUS BUTLER: We built a driving range, and the warden came and said, what do you think about a golf course? And I was thinking it was a joke, you know, and he gets something on his mind, he likes to go through with it and be damn if he didn't. -He decided, well, you know, if I build a golf course, these guys will stay here. And they'll be playing golf here instead of 45 minutes to an hour away. And if something happens, I have them here. He got Dr. Orry out of Baton Rouge. He was working for us at the time, loved golf, and wanted to design a course. So he gave them the area, and they began working on it. A few years later, here it is. STEVE ELKINGTON: Joe is just a really strong, athletic guy, you know, he's in the task force here or the tact team. He's in charge of all the tact teams in this part of the country, just a real strong guy, real fit. I want you to think of when you deliver the club, I want you to put it between your chin and your chest. I don't want you-- I don't want-- you never want your shoulders coming out on the way down. JOE LAMARTINIERE: He told me I needed to work on hitting the ball under my chin and keeping my shoulders down, which I kind of had a feeling that was one of the two things you'd look at. -I don't want the shoulders coming out. I want to feel like when you hit, I want to come-- I always feel like it comes under this slot. People say to me all the time, what are you-- what are you thinking about? How do you get down? I always think of it-- there is an area underneath my chin where I like to deliver my swing from. Underneath. It's always coming from underneath. I thought that was a pretty easy tip for him to work with him, get him to hit underneath, and under his chin more. It's just a thought in your head. I want you to think of it. This is where it's going to be delivered, you know? That's where we're going to-- yeah, that's right, under the chin. -Of course, it felt really weird for a while, and it still does. So I am going to keep working on those. It was great to get some advice from somebody that's a PGA champion. That's awesome. -OK. Here we are. We're almost on the first tee here. I always thought Louisiana was flat and had alligators and was flat. -You're very wrong. We have a lot of hills here. -You got a lot of hills here. And you designed this up here. This is a 57-steps journey to the top of the hill. TRAMPUS BUTLER: Worst decision ever made on a golf course. -You know, in Japan, they have those movable people walkers like they have in an airport where they have a little escalator. -Y'all got the budget for that. Joe and I, we have our name about teams called Angola tact. What's your team? -My team, it's written on the golf ball right there. -It is? What does it say? STEVE ELKINGTON: Team Beat Elk. Oh, that's a keeper. TRAMPUS BUTLER: Good shot. That's my partner. CHRIS EWING: The local pro here. STEVE ELKINGTON: Local pro, course record holder. Oh, yeah, good swing. That's my partner, Joe. Oh, that's all right. We're going. TRAMPUS BUTLER: Steve his his not as solid as we thought he would. But he was by us about 20 yards. STEVE ELKINGTON: How far y'all got? 320? STEVE ELKINGTON: OK, we only got 218. CHRIS EWING: Let's get this thing on the green, Trampus, get them one down, get them a little nervous. No, and old heeler. STEVE ELKINGTON: I think that is in jail. -Yeah, that wasn't a very good one there. TRAMPUS BUTLER: I'll try to pick you up, boss. -I'm trying this new group Elkington showed me. STEVE ELKINGTON: I think that's in jail too, isn't it? -Yeah, thanks for the tip. STEVE ELKINGTON: I think they're nervous, Joe. That wasn't very good shots from them. JOE LAMARTINIERE: That wasn't good at all. TRAMPUS BUTLER: We got one up. STEVE ELKINGTON: You got one up? TRAMPUS BUTLER: I'm going to take the magic stick out on y'all now. STEVE ELKINGTON: That might cause them a few problems. JOE LAMARTINIERE: What was that? TRAMPUS BUTLER: You ain't seen my short game, homie. STEVE ELKINGTON: OK, homie, whatever. STEVE ELKINGTON: He told me he had a good short game. Oh, look at this. Well, there's our four. Good work, Joe. -We're going to make it. STEVE ELKINGTON: What do you think, bro, straight up the hill? -I don't think it's going to do much at all. Just bang it in the back. I had to make the putting, because he was talking about he didn't give me a putting lesson this morning. -No, I'll give you a putting lesson. -I'll take it. Good putt. I like it. BURL CAIN: Let's do this! Woo! -You got to hit them out here. STEVE ELKINGTON: The dogs of Angola. 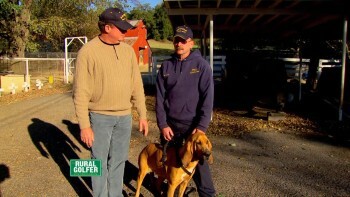 Canines in this hand-picked pack are trained to patrol, guard, and help keep order. TRAMPUS BUTLER: We have different dogs that we put between these fences, a real intimidation factor. If you try to jump that fence, I'm sure they'll bit you and try to keep the inmates from leaving. STEVE ELKINGTON: They put them around the prison in between the old fence and the new fence. And they run them through the center around the border to keep the intimidation factor going. And it's going to work every time. It works. I'm intimidated. I'm back here. He stays mad. JOHNNY DIXON: He don't like anybody. NARRATOR: But this prison officials are used for much more than just apprehension. STEVE ELKINGTON: The bloodhound is used for a lot of reasons. They do, when someone gets loose, you send them out. But they also will track regular kids that get lost in the community, et cetera? -Yes, sir, we get calls from the local sheriff's office, state police, whatever. We track everything from lost kids, to Alzheimer's patients, to armed fugitives. Her name is Lacy. JOHNNY DIXON: She's really special to us. She's really, really fast and very accurate on a trail. We got a call when she was all about a year old, put her on it . We ran him about a mile through the sugarcane. And you know, most of the time, you can't even see the dog with that cane so thick. And we were just going with the dog through there. And the cane started opening up a little bit. I was able to see the dog. And then the next thing I saw was his feet ahead of the dog. We then actually ran him down and caught up with him. So we hollered at him and got him down right there and out on ahead laying. And that was her first apprehension when she was about a year old. CHRIS EWING: I think here is the game plan-- you aim at the guard tower and hit a little light fade in there. STEVE ELKINGTON: What are y'all shooting with? Six or seven? -All right, here we go. STEVE ELKINGTON: Come on, baby. STEVE ELKINGTON: Stay in there. TRAMPUS BUTLER: Did you hit it solid? CHRIS EWING: No, I hit it terrible. -Me and my partner, we had to go first. We were the guinea pigs, because there was a lot of win up there. CHRIS EWING: Come on, Trampus. JOE LAMARTINIERE: Got them on the ropes here, Steve. STEVE ELKINGTON: Yeah, go ahead and take it in there, Joe. JOE LAMARTINIERE: Yeah, we had a pretty good wind in our face about 160 yard. I pulled a six iron and hit a pretty good shot, but it was working with the wind a little bit. And Elk hit about 30 feet to the right of the pin on the green. STEVE ELKINGTON: Certainly the most contrasting view. Here, you had maximum security prison. You could hear the balls bouncing where the guys were shooting hoops. Hey, look at them guys over there playing basketball. I bet you, hey, I bet you I know one thing about them. I bet they wish they were playing golf. STEVE ELKINGTON: They're not probably coming out. So when the reality of all that becomes sort of apparent to you, it's just unusual. It's just a very contrasting day. Come on, Joe, these guys are all but beat. -Oh, they cut the green on me. -Let him buy another whole family. -They cut the green on me. -That's all right. That's all right. I got experience. CHRIS EWING: Look out, boys. JOE LAMARTINIERE: Get in. Oh, nice putting. TRAMPUS BUTLER: This ought to be straight in, going a little right, just firm it in there. It shouldn't move. Bam, OK.
STEVE ELKINGTON: So it looks like we're going to go down to the wire. NARRATOR: Trampus Butler has a history at Angola. But unlike the inmates, his is the kind that could actually help in job interviews. Trampus comes from a line of Butlers who helped make Angola what it is today. Prior to his father's assistant warden position, Trampus's grandfather was the warden at Angola. Trampus himself is a corrections security major. -I supervise a shift of approximately 40 officers consisting of captains, lieutenants, and sergeants of cadets. And I oversee the running of about 1,200 offenders, ensure that they are properly fed, clothed, go to work on time, and confiscate contraband if they have any, and just tend to their everyday needs. NARRATOR: An accomplished player, Trampus's skills in the golf course design helped bring to fruition the Prison View Golf Course. After building the driving range himself, he was instrumental in getting the course created. Like his approach to his job, Trampus's desire as a player is all about one thing, to be the best. TRAMPUS BUTLER: The competitive fire that it just brings to me, you know, I can come out here and play nine holes by myself. And when you tee it up against the best in the state, or the best in the city, or the best in the parish, and it's competitive. It's just you want to be the best. It hardly ever happens, but you try to be. CHRIS: I could free Trampus up a little and go ahead and let the big dot eat right here. -You hit it solid, didn't you? -No. That grip, I just got to practice. -Good ball. The old boys in the cell block like that. JOE LAMARTINIERE: The last hole was awesome. Elk hit a shot right down the middle. We had about 110, 112 yards right in the center of fairway. I'd hit mine to the right of the fairway. But with the angle of the green, the green is sloped back towards us. So he had a better angle. We went with it. Trampus hit it up there about 6 foot. -We're getting jacked up about winning this hole. CHRIS EWING: We actually thought after he hit we were in the leather. So we're over there celebrating early thinking we had a victory. We don't want to early call anything. We have seen their putting stroke. When we walked on the green, I saw where they were. I figured there was no way they were going to make their putt, and there was really no way we were going to miss ours. -Look out. Oh! All right, Elk, there's no excuse, because you got a good read there. Knock it in, buddy. -It's got a chance, boom! TRAMPUS BUTLER: Elkington just made a bomb on us. I mean, I didn't ever think he would make that. -There is the tact force right there. That's the tact force. -That's what we do. We were lining our putt up. They were over there talking about something they were doing later. They'd already checked out of the match. In their mind, it was over. And then the spear went in, chu, chu, spear went in, and then all of a sudden, the air went out of the bag, so to speak. -We got our work out, boss, top of the cup. STEVE ELKINGTON: One down. One down. -That was nasty. We got stomped on right there. -The tactical boys took it. -Thank you. Thanks for having us over here. TRAMPUS BUTLER: He kind of threw it in our face a little bit, you know? For a guy that has 17 wins under his belt to beat a guy like me and Chris, it was a little overboard. It just showed me what kind of person he is running off the green like that. -Joe go get the-- go get the-- go get the loser's trophy that they have to do. STEVE ELKINGTON: What Alex Mercer told me, the whole reason that you build this right here is that this is a saddle, like a saddle of a horse. And when this comes to the top of the swing, we want this to create-- he says, you want this to create a V so that the club will sit. Gravity will hold it in the correct alignment. If you have it over here, you will create a saddle. But now, the gravity has pulled it to this position. And if you go over here, gravity is going to hold it the other way. So the reason that you put it there so precisely is that when you drop it, gravity holds it square. -Trampus, could you pass me the hot sauce, please? -Man, I wish we would have made that putt. -We had an incredible run this year on the show. We have been everywhere in North America from Texas-- I go shoot right over you. -Oh, yeah, he's not going to shoot right over me, because he missed. -Minnesota. We have fun when we played golf together, Rocco and I did. -That's what we're going to do, forever. -Twice across to Canada. I am in the international arena at Spruce Meadows on a horse. We met the most exciting people. I thought it was a big joke, but that's serious. STEVE ELKINGTON: I saw guys that throw ropes for a living. I'm keen to learn about all this today. I want to know everything. I don't think I'm going to be able to do any of it. Guys that catch crabs. -The things I look at when I'm out here are the pictures people that work indoors look at on their calendars. -I was even on a horse four times, and I don't even like horses. He's got reverse. We're going to show you some of our favorite things that happened this year.